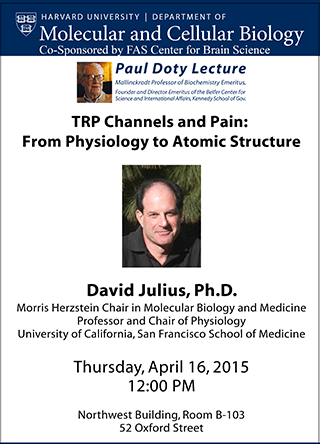 David Julius, Professor and Chair of Physiology at the University of California, San Francisco (UCSF), will deliver the 2015 Paul Doty Lecture on April 16, 2015. This annual lecture celebrates the scientific and public policy achievements of Harvard University Professor Paul Doty, founder of both the Departments of Biochemistry and Molecular Biology—known today as Molecular and Cellular Biology—and the Belfer Center for Science and International Affairs. Interested in the molecular physiology of pain, Julius strives to understand how signals are received and transmitted by the nervous system. Using natural products such as capsaicin (the compound that makes chili peppers “hot”) and methanol (the cooling agent in mint leaves) as probes, his lab identified ion channels on sensory nerve fibers that are activated by heat or cold, providing insight into the process of thermosensation. He is now investigating how these ion channels contribute to the detection of heat and cold, and how tumor growth, infection, or other inflammatory responses moderate ion channel activity. Julius’ findings significantly advanced the study of pain and may lead to new pain therapies. Additionally, he is using genetic methods to identify what roles neurotransmitter receptors play in physiological and behavioral processes such as anxiety, pain, thrombosis, cell growth and motility. Julius has won numerous awards for his groundbreaking research, including the Dr. Paul Janssen Award for Biomedical Research, Shaw Prize, Passano Award, Prince of Asturias Award for Technical and Scientific Research, the McGovern Institute for Brain Research’s Scolnick Prize, the Unilever Science Prize and the Klaus Joachim Zülch Neuroscience Prize. He is an elected member of the National Academy of Science and the American Academy of Arts and Sciences. Julius earned a PhD in Biochemistry from the University of California, Berkley in 1984, after which he spent five years as a postdoctoral fellow at Columbia University investigating mammalian serotonin receptors with Nobel Prize-winning molecular biologist Richard Axel. Julius joined the UCSF faculty in 1990 as an assistant professor in the Department of Cellular & Molecular Pharmacology. Doty was the Mallinckrodt Professor of Biochemistry Emeritus and also Director, Emeritus, of the Belfer Center for Science and International Affairs, which he founded at the John F. Kennedy School of Government in 1974. He passed away on December 5, 2011. As a biochemist, Doty elucidated the structure and function of large molecules, ranging from the polymers in plastics and fibers, to polypeptides and polynucleotides. He is perhaps best known for demonstrating the denaturation of the double-stranded DNA molecule and its reuniting through hybridization; this technique was key to the era of recombinant DNA research. As an advocate for arms control, Doty led and participated in many initiatives to bring Russian and American scientists together in pursuit of international security, making more than 40 trips to the Soviet Union. He was a member of the President’s Science Advisory Committee (PSAC) during the Kennedy Administration. After retirement, he continued working in this area, for example serving as board member of Soros’ International Science Foundation that provided critical research support to Russian scientists in the 1990s.